We have distilled and refined the enduring elegance of early-20th-century styles to newly present original vintage diamonds in our own line of vintage inspired engagement rings. In the case at hand (and perhaps on yours! ), we've found an unpretentiously elegant neoclassic home for a uniquely lovely early-antique cushion-cut diamond weighing 1.77 carats. The beauty of antique and vintage diamonds, compared to their modern counterparts, are the individual characteristics which distinguish each and every stone. Rather than strictly adhering to cookie-cutter formulas, the diamond cutters of yore viewed each rough diamond as an ancient Greek or Roman sculptor viewed a rough piece of marble, and proceeded to fashion it according to the dictates of nature, and his own artistic impulses, to make the most valuable stone possible. This scintillating stone, lightly tinged with a touch of warm sunshine yellow, is secured by six sculpted prongs between sparkling rows of tiny round brilliant-cut diamonds enlivening the sloped, pinched shoulders. Lightly crafted in platinum, signed Lang. Accompanied by a GIA Diamond Grading Report stating: O-P color - SI1 clarity. Currently ring size 6. 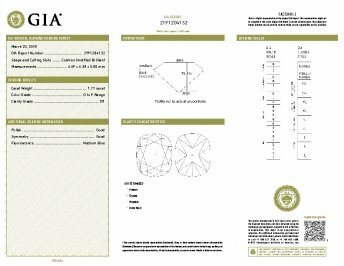 Carat Weight: 1.77 carat Because mountings prohibit full and accurate observation of gem quality and weight, all data pertaining to mounted gems can be considered as approximate unless accompanied by an independent laboratory certificate (AGL, EGL, GIA). Unless otherwise stated, all colored stones and pearls are assumed to be subject to a relatively stable and possibly undetected color and/or clarity enhancement.